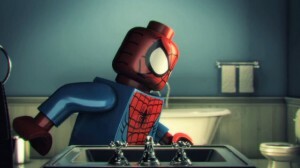 Over a 4 month period, while I was also filming and completing my live-action short film “Patience,” I also created 4 animated short films for LEGO. It was a very busy time since I was doing this in my spare time after work and I was still recovering from my last round of chemotherapy. I did have some extra help to make this possible, so thanks for my friends for pitching in to help! Three of the shorts have been up on YouTube for a couple months while they still haven’t posted the fourth one I made with Spiderman/Peter Parker. Currently the three on YouTube have a combined view of 756,000 views so I’m guessing the Spiderman one will push these four over one million views together! Watch all four below! I had fun making them and can’t wait to see the feature film LEGO movie that’s releasing February 2014! This last one was an episode of a series, the other episodes were made by other filmmakers.